I‘m addicted to chili, earthy, sweet, smoked, and burning hot. I love them all. A reader on my Facebook fan page recently asked me what a peppadew is. If you haven’t tasted this sweet little hottie — you are in for a treat! Not to be confused with a cherry pepper that you find in most Italian or Spanish grocery stores, the peppadew is a native to South Africa and has a very unique flavor when pickled — a taste that brings sweet and sour sauces and even barbeque to mind. Thinly sliced, you can add them to a cold spring or summer salad from macaroni to potato — peppadews will add a little heat, but a lot of flavor. 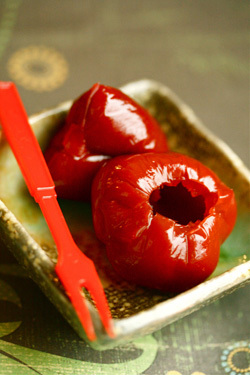 Substitute peppadews for any recipe that calls for pickled cherry peppers.